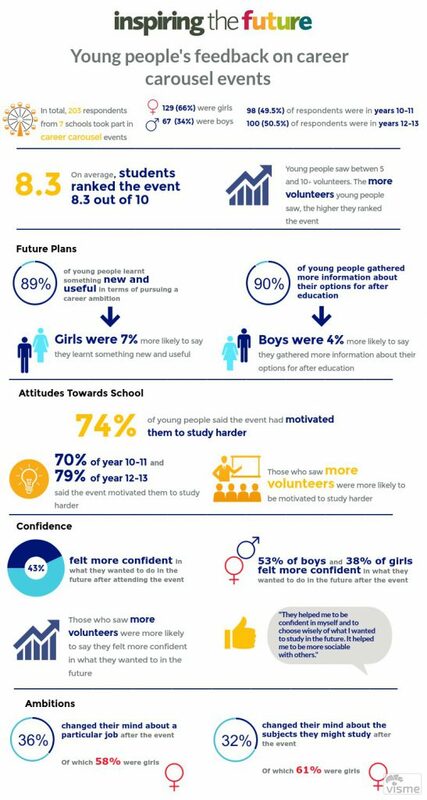 We keep telling you why we think it’s important for volunteers to give up their time and about the research evidence on the impact it has on young people. But what do the young people themselves think? We recently surveyed students attending Inspiring The Future career carousels to find out exactly how they’re being helped to plan for their futures. Among other results, we discovered the session helped 89% of young people to learn something new and useful about the career path they wish to follow. As an added bonus 74% said the event had motivated them to study harder! What was also evident among the results was the more volunteers a young person saw, the more useful they found the event as this helped to build their confidence and gave them more information regarding future options. The survey results were collected from over 200 young people after attending a range of careers carousel events and we’d like to say a big thank you to Unilever and Bank of America Merrill Lynch for hosting the events. This type of event consists of students talking to different groups of volunteers in one session from apprentices all the way up to the CEO, enabling them to meet a wider variety of people from the working world. Clearly from what young people are telling us, the key to informing their futures is giving them as many chances as possible to hear and learn from people in the world of work so sign up for free to help inspire the future. If you’re interested in hosting an event at your organisation or simply want to know more get in touch at enquiries@inspiringthefuture.org. You can also sign up for our research e-bulletin to receive updates about our work.